San Antonio's (not so) surprising Hammer action, the craftiness of Marc Gasol, and "weaking" the middle pick-and-roll. Friday Film is a regular feature where I’ll highlight a few interesting pieces of film from recent games. Years ago, George Karl drew up a unique kind of play in a timeout. The idea was to throw the ball into Darvin Ham in the post as a decoy to occupy the defense and then back screen a player to the opposite corner, where Ham would throw the pass. It worked exactly as planned, and Hammer action was born. (Because what else would you call a play drawn up for Darvin Ham?) The action works because the entire defense keys in on the player with the ball, and doesn’t realize that the point of the play is what’s going on across the court. Shifting player attention like this is very powerful. Players are taught to focus on the ball because the ball is what scores. Pay too much attention to your man, or to weak-side action, and you’re not in position to help if it’s needed. Hammer action flips this on its head, punishing players for being too ready to help. 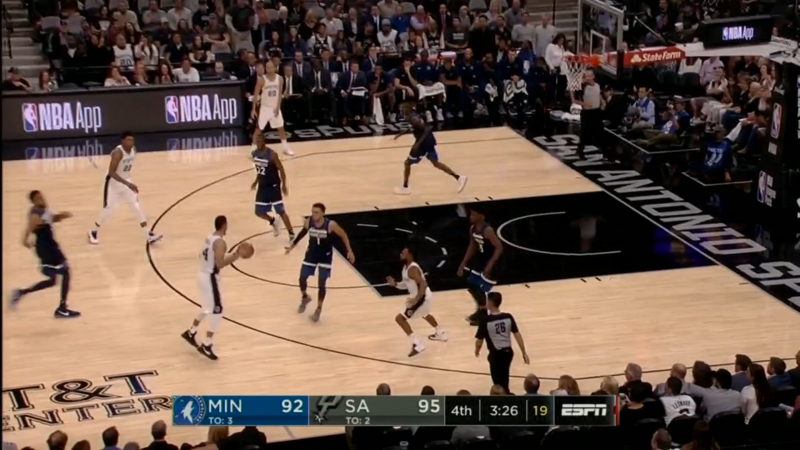 If Hammer action is based on the magician’s art of misdirection, Gregg Popovich is the NBA’s foremost illusionist. For years, the Spurs have used Hammer action out of timeouts or in big moments, but run it rarely enough that opponents don’t get used to it or spend too much time preparing for it. They’ll mix up what action is run as the initial misdirection, so that opponents can’t anticipate that the Hammer is coming: sometimes it will be a pick-and-roll, sometimes a handoff, sometimes an off-ball screen. Toggle slow motion in the video using the “SLOW” button. Jump back in the clip using the button. In the NBA, the road team gets to choose which basket they want to play on to start the game, and the teams flip at halftime. Most teams choose to defend the basket in front of their bench in the second half, for exactly this reason: so that in a close game, when they know what action is coming, their team is more likely to hear them. Minnesota’s game preparation was on point. Their team was right in front of them. And still, the Hammer was dropped.